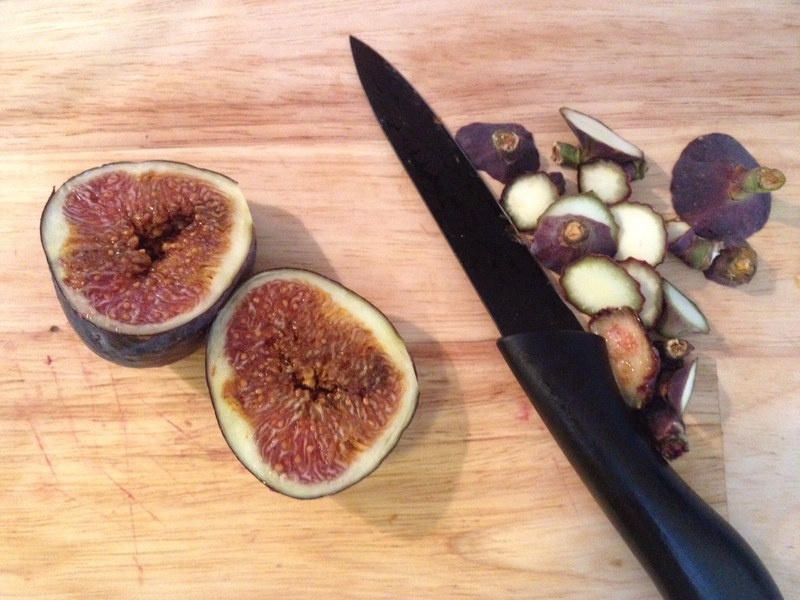 Figs were half price at our local Waitrose this autumn. 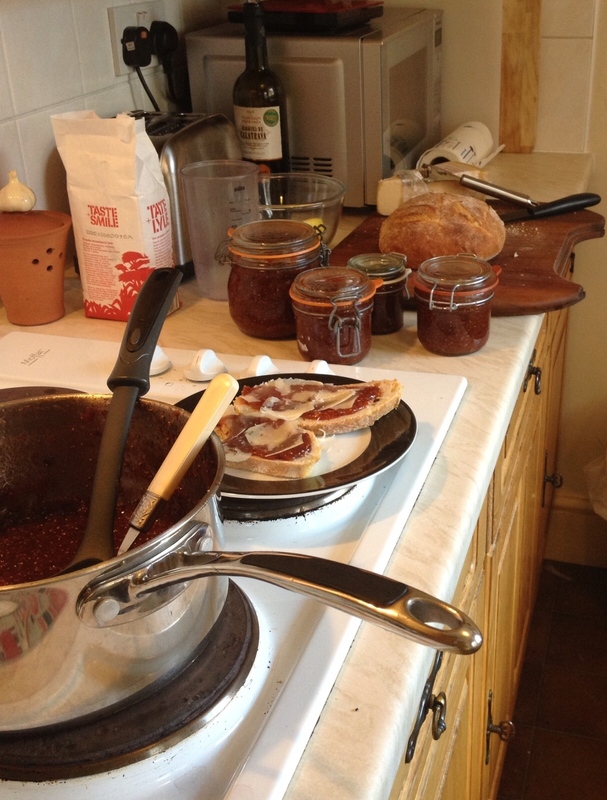 I bought enough to make a batch of Marmellata di Fichi (Fig Jam). This is made pretty much like any other jam thought the ratio of sugar to fig is a bit less (I used 1.5 Kg of figs and 600g of caster sugar). I also added the zest of one lemon, the juice of half of the lemon and about 3 teaspoons of Chinese 5 spice (I know not the traditional Italian recipe). I think Chinese 5 spice should be used more widely. The mix I have consists of ginger, star anise, fennel, cinnamon, and cloves. It is wonderful in most things where you want a bit of Christmas-y/ Autumn-y hint. Because I didn’t have enough jars to hold all the jam I made I ate some on rustic french bread with a bit of parmesan cheese grated on top. Aware that if I ate the all the jam that did not fit I would be come both ill and very fat, I decided to make a tart. 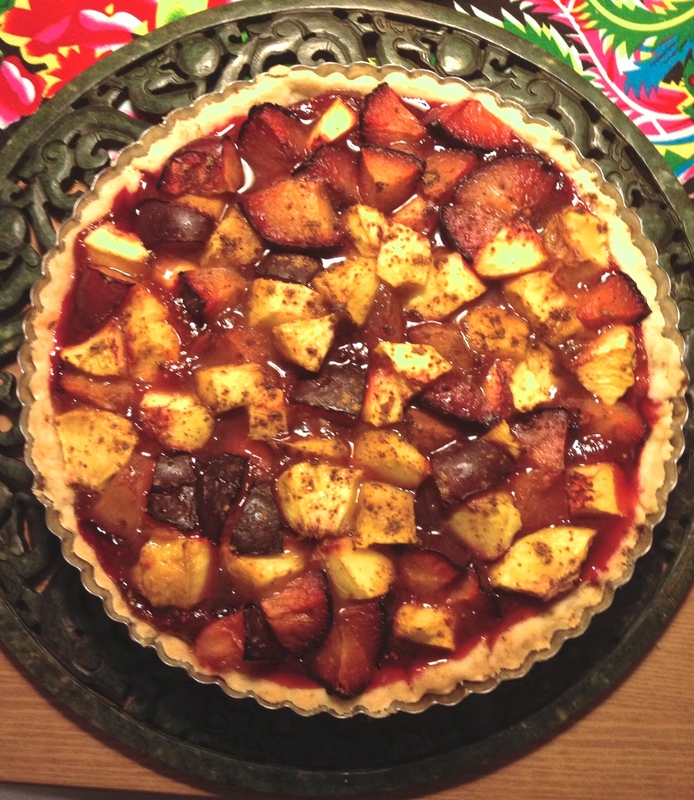 Fortunately I had some shortcrust pastry, plums and nectarines. To make the tart all I did was bake the crust blind until it looks like crust rather than dough, but before it gets brown (baked at 180C). While the crust is cooking, chop the fruit and mix with a bit more 5 spice. You could add sugar, but this is not really necessary given that the part cooked crust is spread liberally with the fig jam before receiving the fruit. Put all this back in the oven for about a half hour. This was one of those projects where things just seem to work out. While I was waiting for the tart to cook I was looking at twitter and @beardfoundation tweeted a link for Peach Crostata with Spiced Mascarpone (http://www.jamesbeard.org/recipes/peach-crostata-spiced-mascarpone). I reckoned the spiced mascarpone would be really wonderful with this tart. And it was! This entry was posted in Food, Recipe and tagged fig, food, Marmellata di Fichi, recipie, tart by geofoodie. Bookmark the permalink.